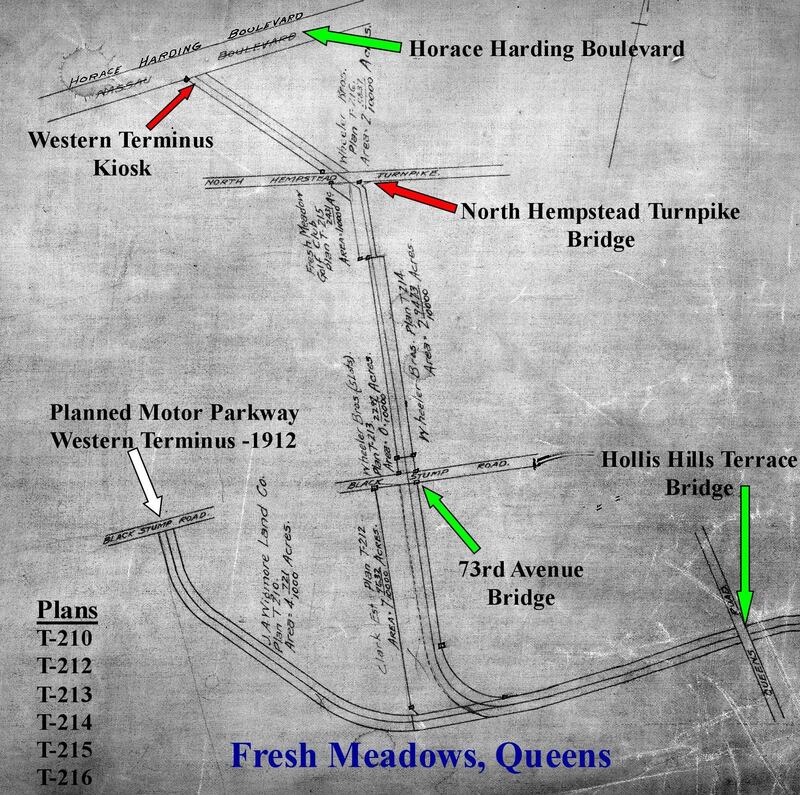 As noted in earlier posts, the final western terminus of the Long Island Motor Parkway was located at the Nassau Boulevard intersection in Fresh Meadows. 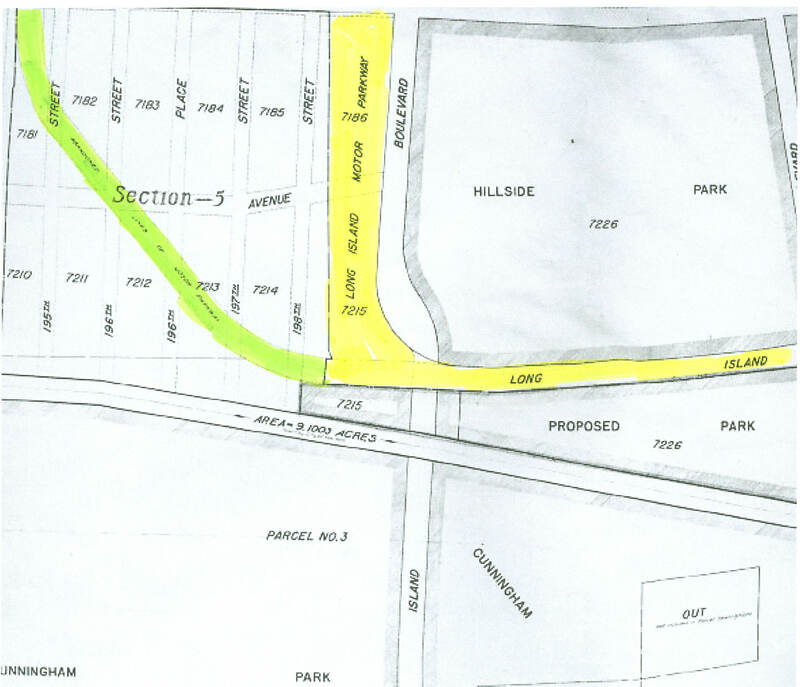 However, a review of original Motor Parkway survey maps indicate that this was not the original plan. One of the treasures of my original Motor Parkway survey collection and a key to to the survey maps is a 48-page 1928 "Atlas" documenting the right-of way, the original property owners, and the corresponding survey plan #s.The Atlas includes the entire 44-mile right-of-way from Fresh Meadows to Lake Ronkonkoma with surveyor notes added in 1929 and 1930. This is the Fresh Meadows page of the Atlas. I have added captions for the key Motor Parkway structures including the Nassau Boulevard terminus and kiosk, the North Hempstead Turnpike Bridge and the 73rd Avenue Bridge (then called Black Stump Road). Note the two Motor Parkway curves at the bottom of the page. At first, I thought the curve on the left was an entrance and exit at 73rd Avenue that was never built. Wrong! 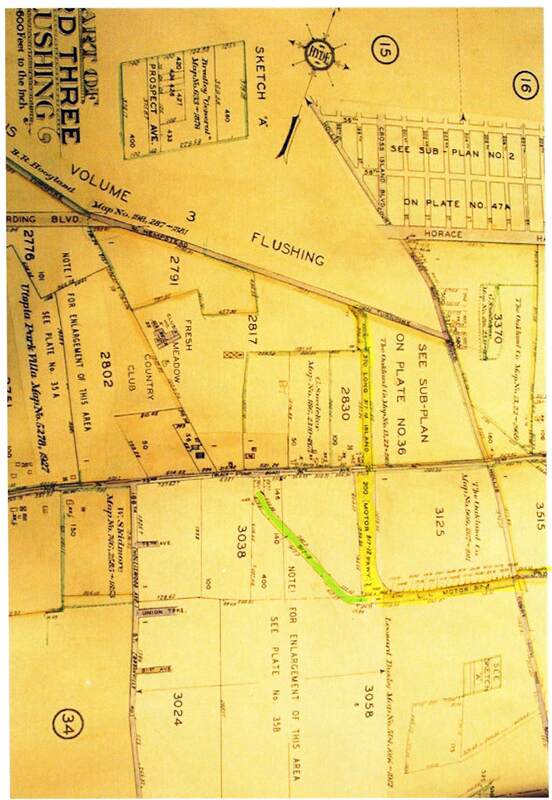 As documented in a 1912 survey map, this was going to be the planned western terminus ending at 73rd Avenue. I would assume that the Long Island Motor Parkway, Inc was unable to acquire the land north of this site needed to connect to Nassau Boulevard. They decided to abandon the 73rd Avenue entrance and built the parkway further to the east with the entrance/exit at the busier Nassau Boulevard. 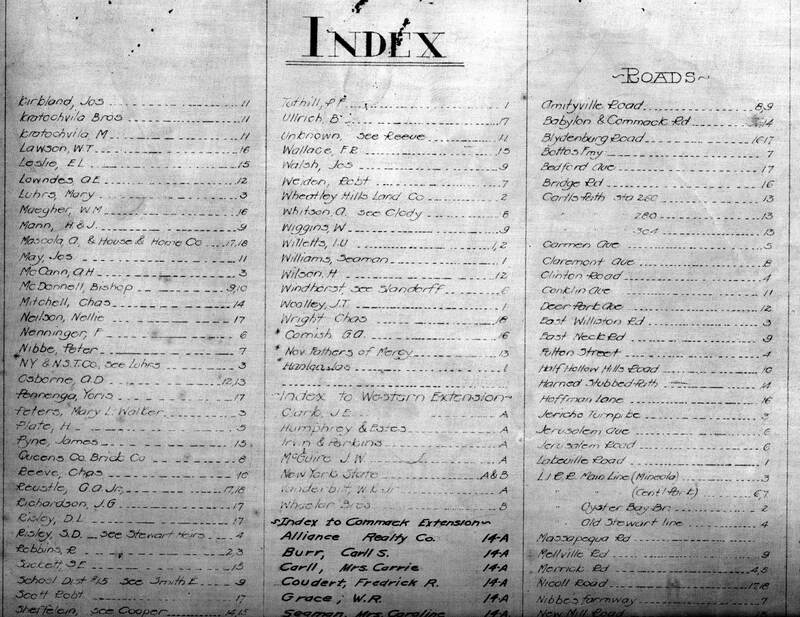 December 8, 2009 Update: Al Velocci has informed me that 73rd Avenue was going to be one of the major Queens roads in 1912. However, when the Motor Parkway finally became building this Queens section in the 1920s, Nassau Boulevard was the most heavily traveled public road...resulting in the change of the route. 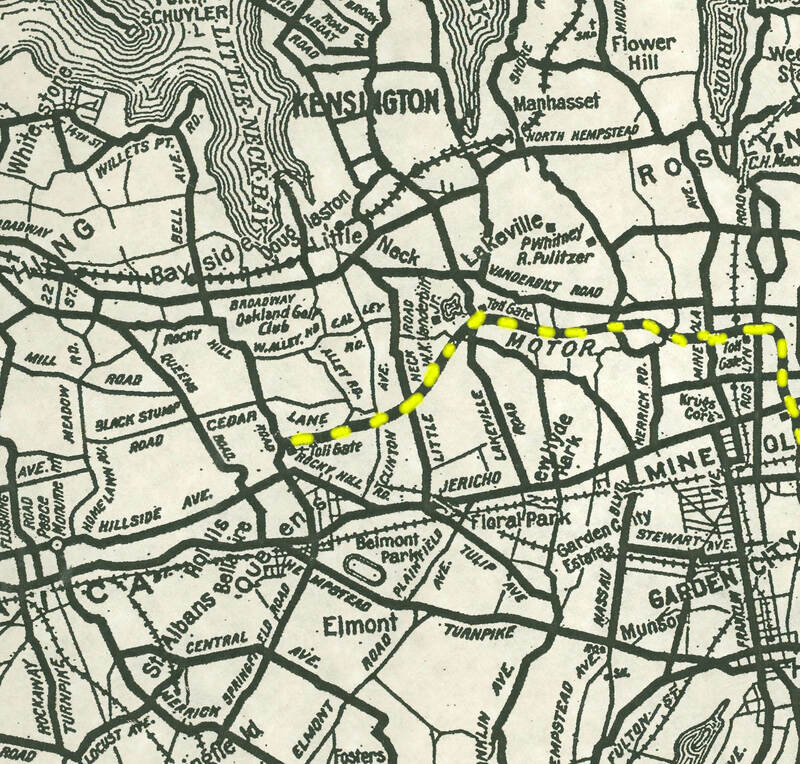 This 1912 Queens map shows the Motor Parkway ending at Rocky Hill Road (Springfield Boulevard). 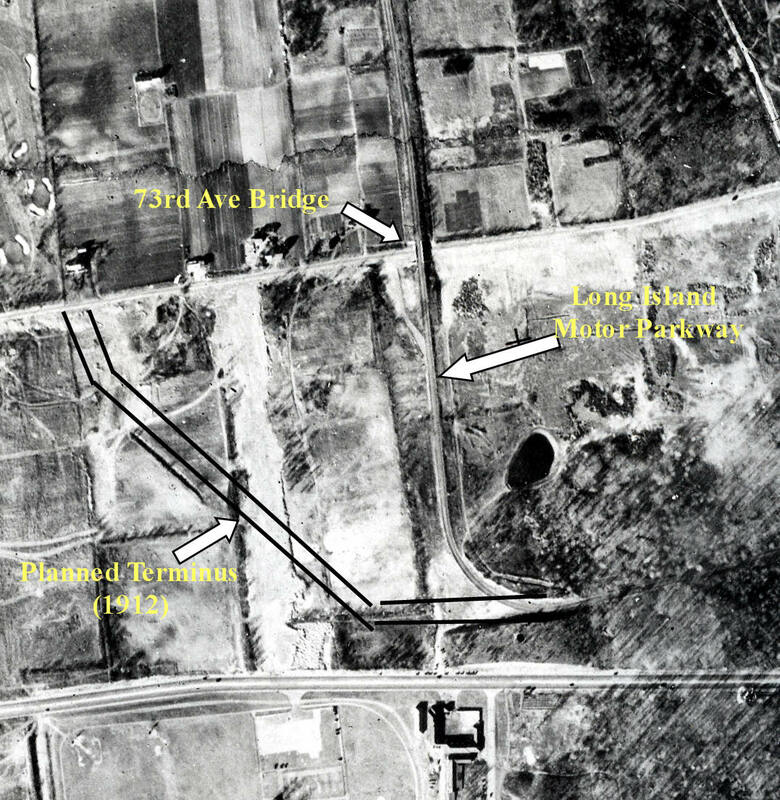 In this 1939 aerial of Fresh Meadows, there is no evidence that the first planned terminus entrance at 73rd Avenue was ever built. Note: a smaller entrance was created near the 73rd Avenue Bridge. December 23, 2009 Update: Al Velocci has confirmed that this "temporary entrance" was built by the Motor Parkway around 1927 when Nassau Boulevard was being built and paved. The entrance remained open until the Motor Parkway closed in 1938. 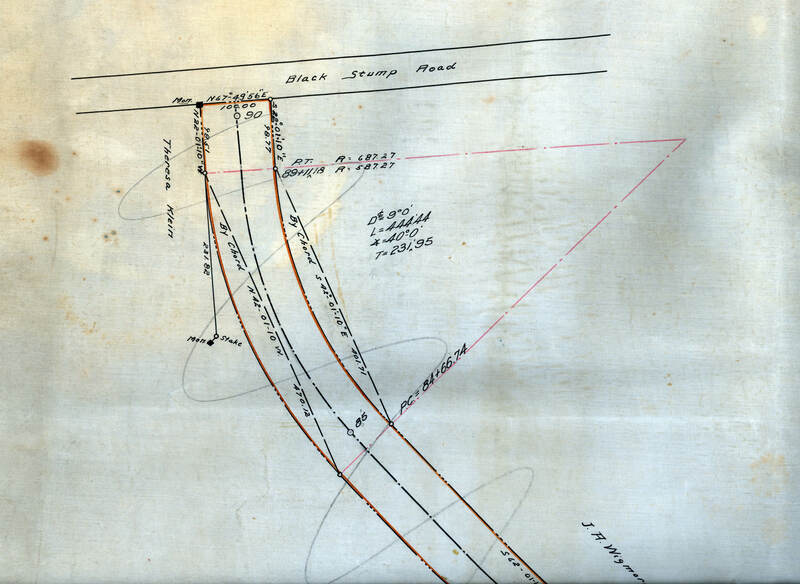 This map indicated that the initially planned Western Terminus to 73rd Avenue ran diagonally to 194th Street. This undated Belcher Hyde map shows the two alternative western termini. Note the second terminus ended at North Hempstead Turnpike. This 1930 Dolph & Stewart map is a good example of why you can not trust maps. This map incorrectly shows the the never built first terminus and not the actual location of the Motor Parkway. 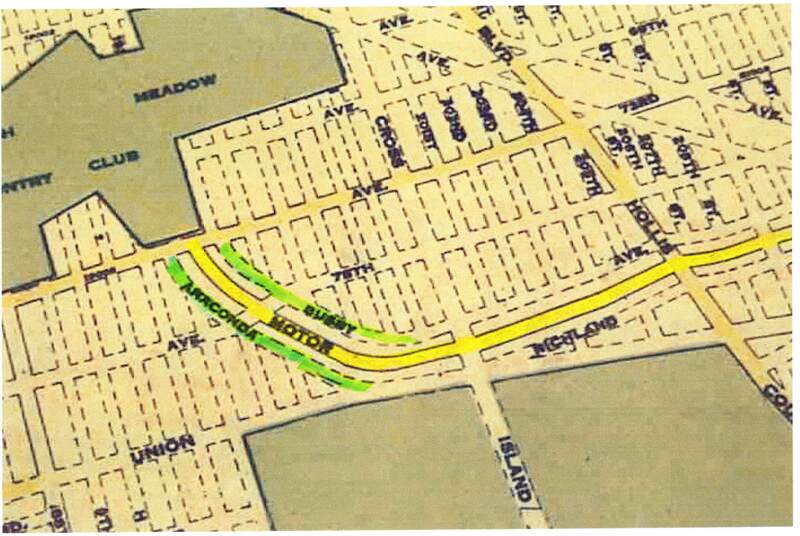 Mitch Kaften also notes the "Anaconda" and "Busby" service roads on the map that surround the "Motor Parkway" but also were never built. Thanks Mitch for your contributions! Dear Howard: The aerial is from just after 1936, when PS 162 opened, which is at 53rd Ave and 201 St. My house at 199 St. and 51st Ave. had not yet been built. Francis Lewis Blvd. ends at Horace Harding. I moved in in 1953. There were still many vacant lots and undeveloped commercial properties. Thank you for the shot. Great stuff Howard, especially the landowners. Terrific, Howard! Looking forward to seeing all the survey maps. I have several documents about this alternate 73rd Ave. ending, which I will send you by email. I was never sure if it was a) planned but never built, or b) built and used while the HHB extension was being constructed, and then abandoned. Also, perhaps the rights of way for the HHB extension had not been completely acquired yet. Does anyone know for sure what happened? Great to meet you last night at Southold. The Motor Parkway never “crossed” Cross Island Boulevard since this road was built after the parkway was closed in 1938. Cross Island Boulevard was built just to the left of the Motor Parkway as seen in the above first photo. This street would later be renamed Francis Lewis Boulevard to avoid confusion with the Cross Island Parkway. The current bridge over Francis Lewis Boulevard was added in the 1940s to connect the bike path.